By all accounts, Brett Ratner’s Hercules should have been almost dead on arrival. Despite a charismatic lead actor in the form of Dwayne Johnson, nobody had faith that the guy who single-handedly derailed the X-Men franchise could deliver the emotional and intellectual weight that a story such as the Greek myth could potentially provide. So, how does Ratner manage to pull it off anyway? The short answer is, he doesn’t. Well, not the intellectuality anyway. It is a very by-the-numbers swords ‘n’ sandals film that uses every cliché under the sun with characters as thick as sandpaper and a plot not much thicker. But there’s an unexpected key ingredient that Ratner has stuffed into this hunk of cheese that in any other circumstance would smell utterly rotten: he’s made it fun. Oddly enough, Hercules feels as if it’s aware it’s not the freshest action movie out there and does everything it can to just go along with it, despite the fact that the audience has seen it countless times over and over. It doesn’t play things too seriously – a trap most blockbusters of late seem to have sadly fallen into – and as such remains light-hearted enough to enjoy without having a sense of gloom hanging over it. Take supporting player Ian McShane, for instance – here’s an actor who’s probably best known for turning in dark and serious performances in other films, usually as the villain. Here, though, he’s one of Hercules’ band of mercenaries (think The Expendables mixed with Conan The Barbarian) with an apparent foresight that can predict when he or his comrades will die, and thus gets one of the film’s most amusing running gags as he keeps avoiding death when he thinks it’s unavoidable. If it were in the hands of a less competent director McShane would have probably been instructed to play it straight and completely humourless as he normally would, but Ratner seems to have given him the free reign to be as knowingly goofy with it as possible. It’s a testament to how enjoyable this film is when even a sinister actor like McShane can let himself get sucked in to the madness and come out the other side with a huge, knowing smile on his face. In fact, a lot of main actors in this movie are playing against type when one thinks about it. McShane as a bumbling prophet, Rufus Sewell as NOT a villain (the hell’s going on here?!) and even John Hurt as… well, that would be a spoiler but given this film’s constant use of tired plot twists you can probably figure it out for yourselves. They are all led, of course, by Johnson’s titular character who more or less anchors the whole movie (and that’s not a comment about his heavy muscle-bound body). As ever, the former WWE wrestler has the charm and charisma turned all the way up and turns out a protagonist that, while not necessarily three-dimensional, you want to follow into battle regardless. 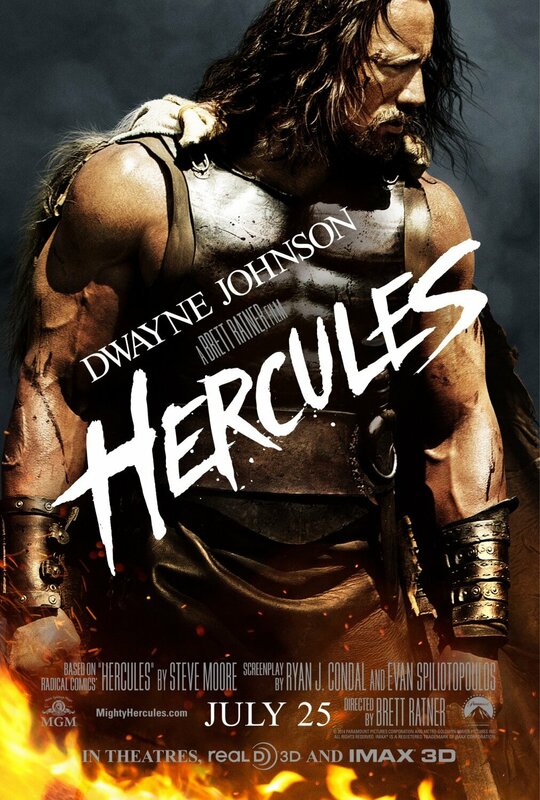 In addition, much like McShane, Johnson seems to relish in the over-the-top mentalities that the film conjures up – his soon-to-be-immortal delivery of the simple line “I am Hercules” is gloriously silly and OTT, but by God we’ll be damned if he’s not loving every moment of it. All this being said, however, if you’re not particularly fond of any of these clichés and are sick to death of them then it’s likely you won’t enjoy this movie that much. As stated before, this film plays things very much by the book and doesn’t try to give us anything new in its story or character, so if you can’t stand scenes like Hercules giving his army a grand speech almost directly taken from Braveheart, Lord of the Rings et al or the same character lamenting over the loss of his wife and children like every other action hero movie character from the 80s and 90s then you’re going to have a difficult time getting past all that and just enjoying the show. If you do feel that way, then be happy that the fairly short running time of 98 minutes means you’ll be able to be out of there quicker than you may think. In the end, it’s the abundance of clichés that make Brett Ratner’s Hercules more fun than it has any right to be. There’s a strange sense of meta thinking when watching this movie, like the characters know fully well that they’re there to entertain the audience rather than develop their own characters. They seem to recognise that everything they do or say is something that they’ve heard again and again, so they just go along with it under the belief that the familiarity will at the very least raise a few chuckles. After all, Hercules himself wears the skin of a giant lion over his head like a hoodie, not unlike Nicolas Cage’s infamous bear costume in The Wicker Man. If the mental image of Dwayne “The Rock” Johnson wearing what is essentially a rug over his head doesn’t make you appreciate the sheer insanity of this movie, then nothing else will.